Someday very far in the future, many of the things we see and use every day will form fossils in rock. An archaeologist or paleontologist may dig through the rocks forming right now and find the marks or remains of today's plants and animals. You can make several kinds of fossils out of a leaf, bone, feather, shell, or other object. 1. Mold Fossils: Make the fossil mold in a soft material that will hold an imprint when you press a large, thick object such as a shell down into it. Place a layer of modeling clay (for a temporary fossil) or liquid plaster of paris (for a permanent fossil) into a greased shallow pan. Grease the surface of the clay or wet plaster to prevent your object from getting stuck. Press the object down onto the surface of the clay or plaster. These steps have given you the bottom half of your fossil, but remember that when fossils form underground, a layer of rock covers the object making the fossil. To make a complete fossil, you will need to add a top layer to sandwich your object, just like in nature. Lightly grease the surface of your object, and add another layer of clay or plaster to the top, completely covering your object. If you are using clay, gently press it down like the pressure of the rocks on the earth. You can now separate the layers of clay to see the fossil mold that has formed in between. If you used plaster, it must dry completely before being separated gently along the seam between the two layers. The space left in the plaster by the object is the mold fossil. 2. Cast Fossil: Next you can make a cast fossil by filling the hollow area in the plaster with liquid latex. After the latex dries, it will have the shape of the object that made the fossil. 3. Trace Fossil: Trace fossils are made the same way as mold fossils, but can be made with thinner, more fragile objects like leaves or feathers. Press the object into a layer of modeling clay or plaster of paris. 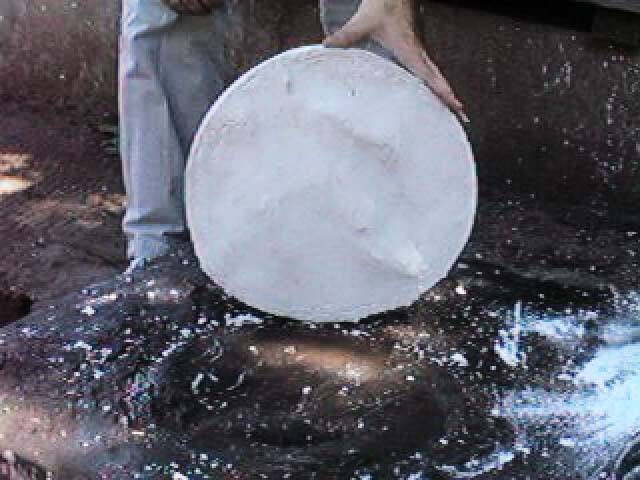 After it has hardened ,remove the object, grease the surface and cover it with another layer of clay or plaster. After the top layer of plaster hardens, it can be removed. You have made an original print on one side and an upraised image on the other. 4. Whole Animal Fossil: Whole small animals can become trapped in ice and preserved frozen for thousands of years. Some animals been captured in tree sap which later solidified into amber. You can make a simulated amber fossil using a liquid resin hobby kit. Follow the directions for mixing the resin with hardener, following safety instructions very carefully. Pour some of the mixture into a small mold, and after it begins to harden, place a dead insect on the top. Add another layer of resin mix, and allow it to harden completely. When you remove your fossil from the mold, the insect will last a very long time.